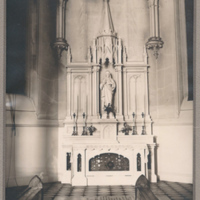 A view of the casket at the funeral for Sr Superior Julia in The Summit's chapel. 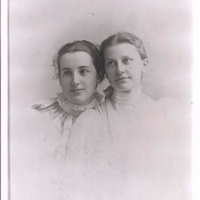 Sr Superior Julia built The Summit from Sr Superior Louise's vision and transformed it into a convent, school, and novitiate. 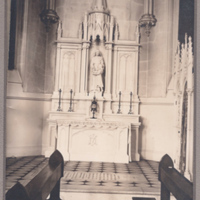 A view of the tomb where Sr Superior Julia was buried in The Summit's chapel until 2012. In 2012, she and Sr Superior Louise were reburied in the cemetery at Mt Notre Dame, so as to be closer to the community. A view of the community at The Summit in 1940. 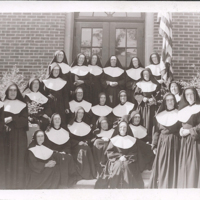 1940 marks the Golden Jubilee of the Sisters in America. 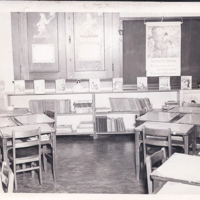 A view of one of The Summit's classrooms. 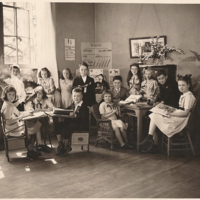 By the early 1920s, the Sisters adopted the Montessori teaching techniques and employed them in the younger grades. 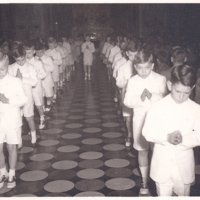 A view of the communion ceremony for the boys at The Summit's chapel. 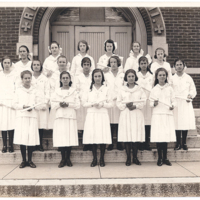 Along with scholastic education, the Sisters also provided classes and preparation for students receiving their First Communion. A view of the front of the newly constructed Summit school and convent. 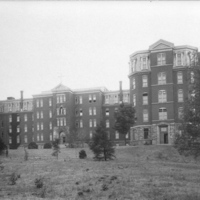 Originally intended to be a convalescent home, construction plans soon changed to include a school in the building of The Summit. A view of the Academy Building at The Summit. 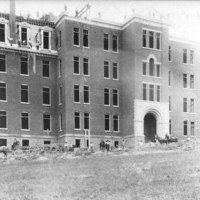 While the rest of The Summit was still under construction, the first 20 students attended the classes on the ground floor of the West Wing, or Academy Building. A view of the construction of the East Wing and main building of The Summit. 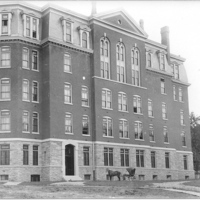 The East Wing, intended for convent space, was still being built while the first classes were taught in the West Wing, or Academy Building. A view of the community at The Summit on the side of the chapel. 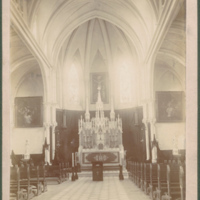 The chapel, complete in 1895, was built in a Gothic style and adorned with many beautiful carvings, windows, and marble. A view of the community around 1910 in front of All Saints House. The house was on the estate that Sister Superior Julia bought when she was looking for a new site. 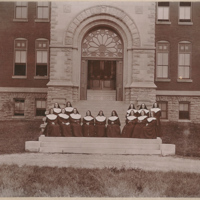 The first Sisters lived in the house before the construction of The Summit. A view of the community of Sisters at the Summit around 1904. 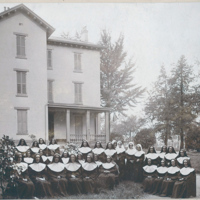 In 1902, the novitiate at the Sixth Street Convent transferred to The Summit, making it the new Provincial House. 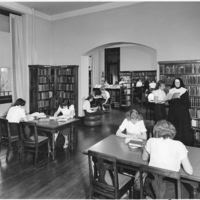 A view of the library at The Summit with a Sisters and students. 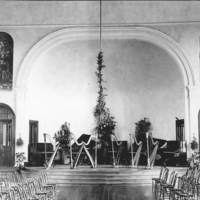 The Upper School at The Summit was initially for girls. It wasn't until the early 1970s that boys were admitted to the high school grades. 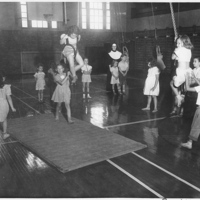 A view of students at The Summit playing on gym equipment. 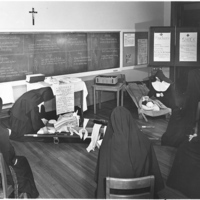 A view of the Sisters preparing for first aid training. 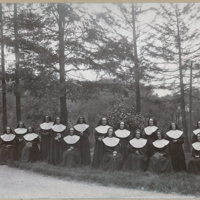 While the mission of the Sisters of Notre Dame de Namur is to teach young students, some Sisters also took learned first aid and volunteered with the Red Cross. 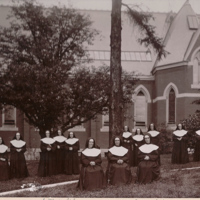 The community of Sisters moved into The Summit convent in 1890 and began teaching in September 1890 to a first class of 20 students.